Did you know that the island of Manhattan in New York was once totally destroyed and was rebuilt by the son of an immigrant from Co. Galway, Ireland? He was one of the first Irish-Americans to wear that title and his name was James Duane. He was born in New York to Irish immigrant parents in 1733; a time when the Central Park was considered ‘upstate’ and a wilderness. He grew up with an interest in finance, real estate, and the law and was called to the Bar in 1754. He earned a reputation for being a bit of a maverick, taking on law cases that no one else would touch. He would defend British clients against colonials or colonials against British interests, as it suited his whim. He made enemies and Ethan Allen’s ‘Green Mountain Boys’ put a price on his head after he took won a border dispute causing a significant part of Vermont to become part of New York State. He did love New York! He tended to be either popular or detested, depending on whether he had been for you or against you in court. However, his talent was undeniable and by 1762 he was clerk of the New-York chancery court and by 1767 he was the state’s attorney general. 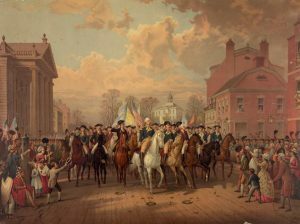 When political storm clouds gathered over the colonies’ relationship with Great Britain, he was ready to help. 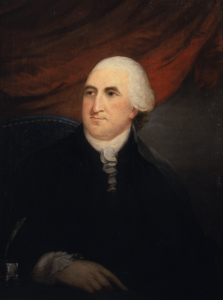 A true patriot, he was active in various pre-revolutionary committees and the Continental Congress. The only reason his name isn’t on the Declaration of Independence when it was signed in Philadelphia is that he was up in New York that week, drafting the state constitution along with John Jay. Some of his associates suggested that he should seek national office, but Duane never bothered; he loved New York too much to leave it. Then, as everyone had known it would, war came in 1776. Long Island fell to the British in late August and peace talks on Staten Island broke down in early September when Lord Howe demanded that the colonists revoke the Declaration of Independence; they flatly refused. Major General James Robertson confiscated surviving homes and gave them to British officers. Much to his grief, Duane’s home at what is now Grammercy Park was seized to use as their headquarters. Churches, other than the Church of England ones were converted into prisons, infirmaries or barracks; common soldiers were billeted with civilians. There was a great influx of Loyalist refugees into the city resulting in overcrowding and many of the returning Loyalists camped in tent cities on the charred ruins. The fire convinced the British to put the city under martial law. Crime and poor sanitation were persistent problems during the British occupation which did not end until November 25, 1783, when they finally left. Most of lower Manhattan lay in ruins and there was no co-ordinated scheme for its reconstruction as funds and manpower were scarce. James Duane was busy during this time as a delegate to the Continental Congress and a circuit court judge; however, when the British left, at last, Washington knew where to turn. He asked Duane to assemble his real estate connections and organize the reconstruction of the city, which was to be the nation’s capital until something more permanent could be arranged. A better assignment couldn’t have been imagined. He got to work, calling in favors from merchants and contractors, soliciting for donations, starting fund-raising campaigns; he organized, bullied, wheeled and dealed. The governor of New-York appointed James Duane, the first mayor of the free New York and he served in that office for two terms, tirelessly rebuilding his beloved city. A street now bearing his name lies close to City Hall wherein a portrait of him now hangs reminding all of an Irish-American who helped to shape the America he loved.